I've got hurtin' songs on the radio and mud on my windshield. I'm deep in cowboy country at Douglas Lake Ranch, near Kamloops. B.C. We're talking big country here. 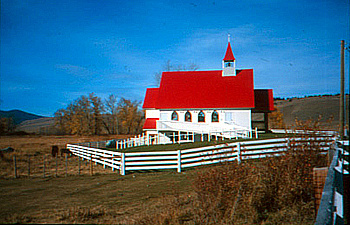 Douglas Lake Ranch, Canada's largest, covers half a million acres and sustains about 22,000 head of cattle. But I didn't come for the cows. I came for the famous, feisty Kamloops Rainbow trout and my first attempt at fly fishing. 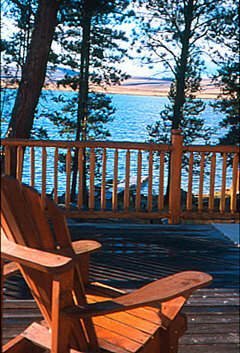 Douglas Lake Ranch has eleven private lakes and two of them, Minnie and Stony, are considered trophy lakes. To say you snagged some rainbows here is like bragging that you played The Old Course at St. Andrews, or aced someone at Wimbleton's centre court. My guru is 23-year old Tyler Bateson who seems a tad young to have the title, fly master. But Tyler's been fly-fishing in this neck of the woods ever since he can remember and he knows his stuff. "On a good day in May or June, you can pull in 40 or 50 fish, some weighing up to eight pounds," he assures me. We're standing on the deck outside Stoney Lake Lodge and I'm getting my first casting lesson. It's going to take some practice before my casts resemble anything like those in A River Runs Through It. "Casting is all about rhythm and timing," says Tyler, whose graceful loops are landing exactly where he wants them. "Women are often better than men because they don't try to muscle the reel. One of the best casters I've ever seen was a four year-old girl." Before heading down to the dock, Tyler puts on his shades. "Never go fishing without sunglasses to protect your eyes," he says. "I've had hooks in just about every part of my body. 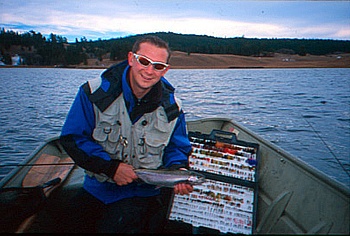 Fortunately, for both anglers and rainbows there's a no-barb hook policy at Douglas Lake. There's also a catch-and-release policy so you take home only your memories and perhaps a photo of the big one. A serious fly-fisher wouldn't even put a line in the water until he or she had studied the lake and turned over some rocks to see what bugs were in season, Tyler informs me. To be successful at this sport, you have to be a bit of an entomologist and biologist. Fortunately for me, Tyler has done his research. Today the fish are swimming deep so all we have to do is troll, no fancy casting required. Tyler heads the electric-powered boat out toward a small island where the rainbows were biting yesterday. I've got our lunch hamper, Tyler's got his gray plastic briefcase containing over 1,000 hand-tied flies. The flies are miniature works of art with intriguing names like damsel nymph, girdle bugs, pregnant shrimp, egg-sucking leach and ice cream cone. Apparently, there are two classifications: the realistic ones that resemble eggs, larvae or bugs in various stages of development and the flashy attractors intended to antagonize the trout and make them snap at them. Today, it seems, is an attractor day so Tyler recommends I start with a red wooly bugger. It's red and silver and looks like a scrap from a disco dress. After about fifteen minutes, Tyler's graphite reel bends dramatically. He's got one. It gives him a good fight and eventually he nets it and brings it into the boat. Out comes the barbless hook. From his multi-pocketed vest Tyler pulls out a mini turkey baster for pumping out his catch's stomach to study what it has ingested. He squirts the contents onto the bottom of the boot. (This seemingly painless procedure isn't as objectionable to either me or the fish as you might expect.) Seems this fellow hasn't had much to eat lately, so we'll stick with the flashy ties. Tyler suggests I try my luck with a new one, an olive green, bead headed wooly bugger. It works. There's a tug on my line. Tyler instructs me to keep the rod tip up and reel in fast. As the fish gets closer to the boat it seems to get a shot of adrenaline and takes a dive underneath. Overhead a giant bald eagle surveys the action. Now Tyler's got a bite. This is exhilarating. After much splashing and laughing, we manage to land them both. Mine, I might add, was the larger of the two, weighing about three pounds. We took the appropriate "brag" photos and then released our catch. Over the course of about two hours, we landed five trout and counted about four more that got away. Now that I've tried fly-fishing there'll be no more lures or live bait for me. Give me more action and less mess. No squishy worms to thread on a hook and no fish to gut are fine by me. For a novice, catching a few fish was a thrill. But I can imagine the real passion comes when you've studied feeding habits, tied the perfect fly, made a graceful cast and outsmarted the fish. The sport can be as simple or complex as you make it. Back at the lodge, some guests were having a pre-dinner soak in the hot tub. I snuggled onto the leather sofa in front of the massive stone fireplace and became engrossed in some old ranch ledgers dating back to 1889. "A side of bacon to Old Sophie, tobacco to the Indian, moccasins and blankets to Young Sophie, a bag of flour to the Chinaman… " Politically correct they were not. Ranch life over a hundred years ago must have been tough. Not so for its guests today. Stoney Lodge prides itself on its cuisine and its selection of Okanagan Valley boutique wines. Robert, the lodge manager, will happily recommend the ideal vino to complement the homemade ravioli stuffed with wild mushrooms and the mustard-crusted rack of lamb. Perhaps a dessert wine to round off the chocolate mousse? This is my kind of roughing it. I said my goodnights and hit the sack early. Tomorrow, bright and early, Tyler is taking me to the much-coveted Minnie Lake where the fishing is supposed to be so good Tyler swears he's seen three rainbows jump straight into a boat. How's that for a tall tale? Can't wait to tell you about the big one that didn't get away.